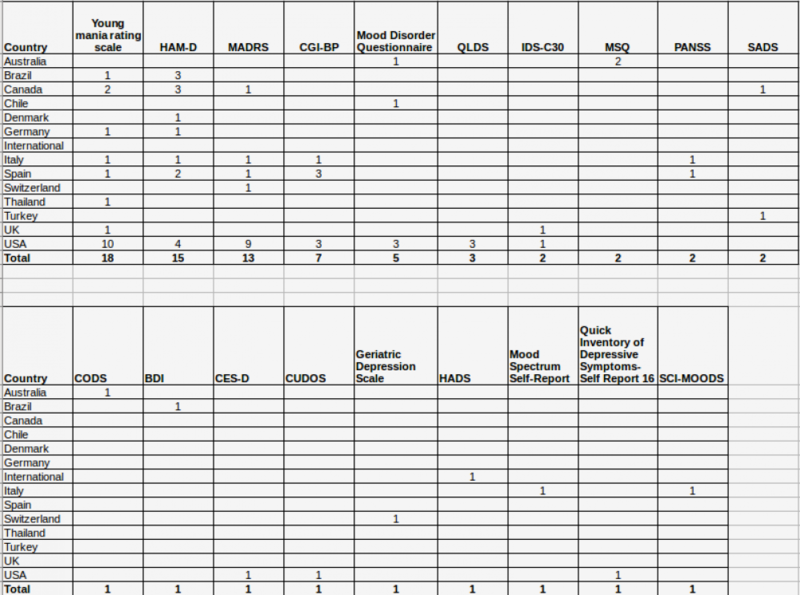 We used the heoro.com database to develop an evidence map of PRO tools that have been used in studies of people with bipolar disorder, which took us approximately 5 hours. Here's what we found. We searched the heoro.com Dashboard for Disease Bipolar disorder, Study type PRO study, on 16th December 2016. We found a total of 127 abstracts that had been indexed in PubMed since 1960, which reported the use of 85 different PRO instruments. Of these 85 instruments, 19 were specific for bipolar disorder, depression or mania, 45 were general instruments used to evaluate quality of life, functioning or utilities, nine assessed other conditions or diseases that were common comorbidities of people with bipolar disorder, including anxiety, eight assessed treatments or adherence, three evaluated the impact of the disease on work productivity and one assessed caregiver burden. The most frequently used tool was the SF-36, cited in 26 abstracts, followed by the Young Mania Rating Scale (18 abstracts), Q-LES-Q (17 abstracts), Hamilton Depression scale (15), MADRS (13) and SF-12 and WHOQOL-BREF (10 each). The United States was the most common setting, with 56 abstracts, followed by the United Kingdom (8 abstracts), Canada and Italy (7 abstracts each), then Australia, Brazil and Spain (6 abstracts each). Drug interventions were assessed in 28 abstracts,and psychological interventions in 15. 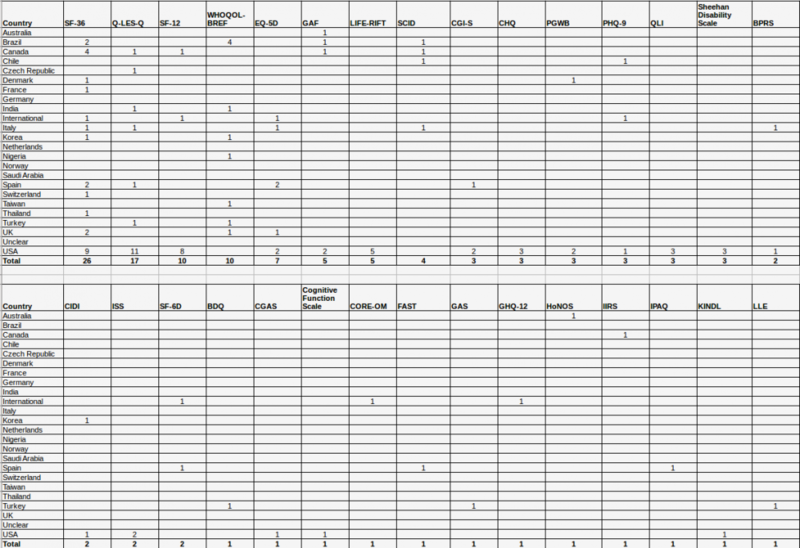 The evidence maps showing the geographical locations where each tool has been used are reported below. The evidence map shows that a wide range of PRO tools have been used in studies of bipolar disorder, but only ten tools were cited in more than five abstracts each. Research into the quality of life in bipolar disorder has generally been assessed from a US perspective.